You might associate kales and chards with winter, but our Power greens add a whole new dimension to this bold leafy green salad! These baby greens are sweet and tender, just perfect for your summer salad bowl. Here we've combined a medley of summer ingredients into a colorful, tasty salad with layers of texture and flavor: the crunch of fennel, the smooth creaminess of avocado, and the sweet juiciness of fresh corn. Our tangy blue cheese vinaigrette is the perfect accompaniment, but feel free to experiment with your own favorite dressings, too. Enjoy! Place the oil, vinegar, cheese, honey (agave), water, salt and pepper in a blender and process until smooth. Stir in snipped chives, if using. Best served at room temperature. The vinaigrette will keep in the refrigerator, covered, for up to 2 weeks; bring it to room temperature again before using. 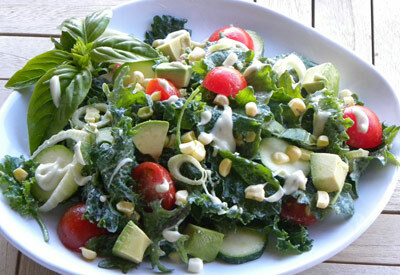 When you're ready to serve, place all of the salad ingredients in a large bowl and toss to combine. Drizzle with about 1/3 cup of Blue Cheese Vinaigrette and toss again, adding more dressing as desired. Serve immediately.